On Sunday, a friend and I hiked with my son on a trail in Portland's Forest Park. Forest Park is so awesome. Surprisingly, I had never been, but I am impressed by the concept of a large chunk of forest in the middle of Downtown Portland. 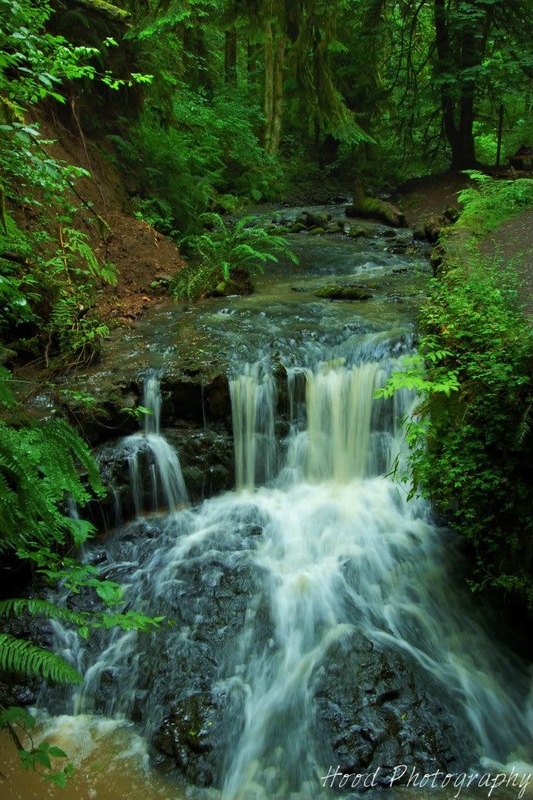 The over 8 mile long park is one of the country's largest urban forest reserves. This waterfall caught my eye as we walked and I had to get a picture of it. The water was very muddy in Balch Creek that day from the recent heavy rainfall, but the picture, including the water itself, is pretty nonetheless. To my American blog readers - Happy Independence Day!!! Great photos ever since your return, and now you're out hiking with your baby boy. You're amazing, honey! Happy 4th! I'm stopping by via outdoor wendesday and was caught by the title of your blog - I happen to be at Govy Camp with my family for ski training. We were rained out yesterday and went for a walk instead. My first time in Hood- I'm hooked. I could spend the entire summer here. It is beautiful. So pretty. I ve always wanted to explore that part of the country. Thanks for sharing! I had no idea there was a park like this in Portland. It's such a huge sprawling city that I never noticed! How beautiful! I would love to have some place close by like that! Everything is so green and lush! Thanks for stopping by! I'll be back! Thanks for visiting my blogsite, i see your wonderful photos. I love most snowcapped mountains like your Mt Hood and waterfalls, no matter how small they are, i still love them. Even manmade falls sometimes do when i can't see a natural one! You don't have a follow-up site in your side bar! That is a fabulous photo! Thanks for your comment. It's difficult to take waterfall shots...this one is beautiful. Very refreshing just to look at!! Thanks for coming by my place and saying hello!! You've taken a stunningly beautiful shot of these falls. It's made me add this park to my bucket list. I've been to parts of Oregon before, and certainly plan another trip in the future. It is beautiful even with the muddy water. Very nice photo. I'm ashamed to say I haven't explored very much of Forest Park myself yet, but I have taken that trail up Balch Creek. It feels like you're miles away from the city.